The singer was spotted hugging fans and strangers. Firefighters battled a blaze that broke out in a 24-story London apartment building Tuesday night. Adele is showing her support for everyone affected by the deadly fire at London's Grenfell Tower. After an overnight fire killed at least 17 and injured more than 70 people, the Grammy winner paid her respects by visiting the scene. According to social media users, the "Hello" singer and husband Simon Konecki were spotted near the incident. Fan sites also reported Adele asking if anyone needed help in between hugging fans and strangers. Earlier in the week, Rita Ora also expressed her condolences for those affected in a message on Twitter. "Shocked and devastated to hear this terrible news," she wrote to her followers. "My heart goes out to everyone affected by this horrific tragedy in West London." According to NBC News, more than 250 firefighters battled the inferno that could ultimately burn for days. One local resident remembered seeing "people dangling children out the windows to try and get them to safety" as flames began to spread throughout the high-rise apartment block. 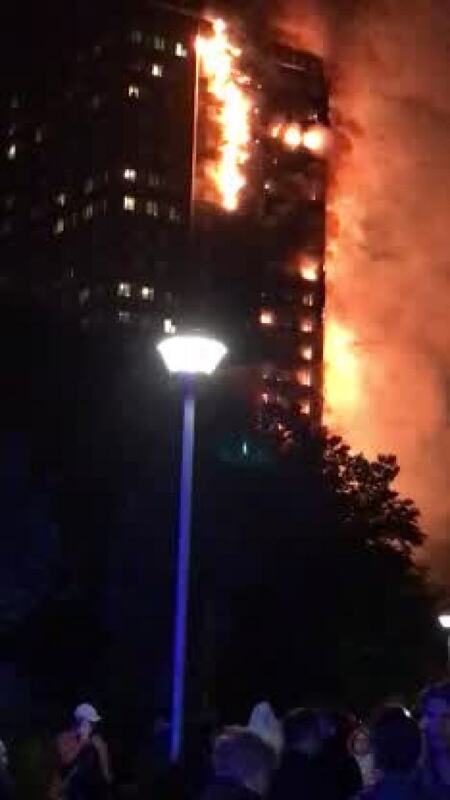 "In my 29 years of being a firefighter, I have never, ever seen anything of this scale," London Fire Brigade Commissioner Dany Cotton told NBC News. "This is a major fire that's affected all floors of the 24-story structure from the second floor upwards." Authorities said the cause of the blaze remained unclear and is under investigation.